This chapter provides an overview of what is currently ‘known’ about desistance theory. It critically explores the three main desistance theories—maturational (ontogenetic), social bonds (sociological) and narrative (subjective) theories—and examines the link between the development of the study of desistance and difference, to include what is currently ‘known’ about female desistance journeys. The chapter concludes that women’s desistance narratives are not well explored in the literature, but that considering desistance from a female and feminist perspective can shed light on the structural inequalities, caused by both patriarchal social structures and neoliberalism, faced by those attempting to (re)build their lives following contact with the Criminal Justice System. Throughout this chapter the words ‘offender’ and ‘former offender’ have been used, as these are words used in the wider literature. 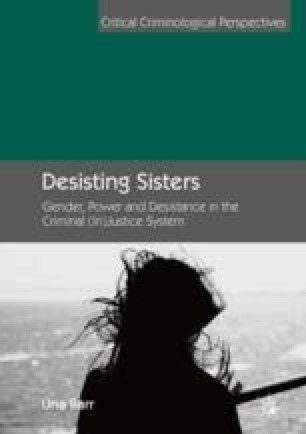 In the following chapters I will argue a move away from this discourse to describe criminalised women who have been affected by the CJS as such (for more see Chap. 5).